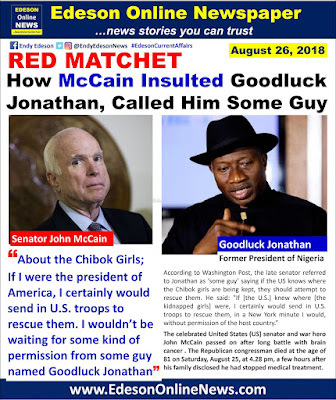 According to Washington Post, the late senator referred to Jonathan as ‘some guy’ saying if the US knows where the Chibok girls are being kept, they should attempt to rescue them. 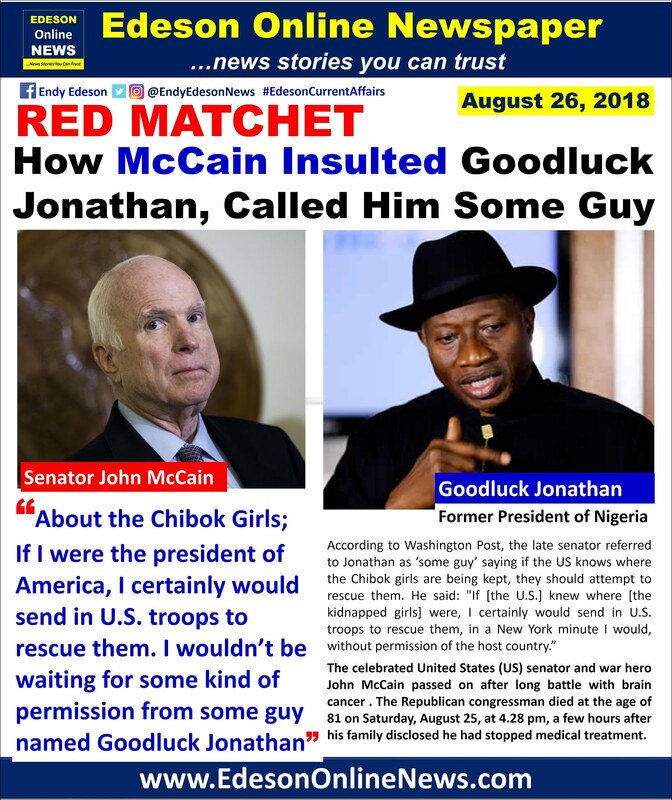 McCain said if he was president, he would not bother asking for permission from Jonathan. “I wouldn’t be waiting for some kind of permission from some guy named Goodluck Jonathan. “I would not be involved in the niceties of getting the Nigerian government to agree, because if we did rescue these people, there would be nothing but gratitude from the Nigerian government, such as it is." The celebrated United States (US) senator and war hero John McCain passed on after long battle with brain cancer . The Republican congressman died at the age of 81 on Saturday, August 25, at 4.28 pm, a few hours after his family disclosed he had stopped medical treatment. The congressman was diagnosed with a malignant brain tumor, identified as glioblastoma, in 2017 and was undergoing treatment until recently when he and the family decided to stop the radiation and chemotherapy. A statement by his family had announced the senator will discontinue cancer treatment. Morenikeji: I understand your angle. This post is mainly for information not to ridicule anyone. It is for people to understand the past, present and the future. What do you expect from somebody that have brain cancer or tumor. Rip American boyoyo senator.